Fights widespread hair loss and diffuse hair loss. Regulates the levels of fat in the scalp. 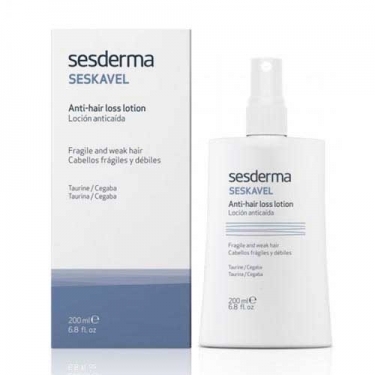 DESCRIPTION: Seskavel Anti-Hair Loss Lotion from Sesderma is a lotion for the treatment and prevention of hair loss. Formulated with Cegaba, Taurine and Zinc, it strengthens and stimulates hair growth, reduces the production of sebum and dandruff, revitalizes and soothes. The result is healthier, stronger and brighter hair. Apply to dry scalp with a gentle massage. It is recommended to 6 sprays in the morning and 6 in the evening for 4 months. As maintenance, it is recommended to apply 2 to 3 times per week.